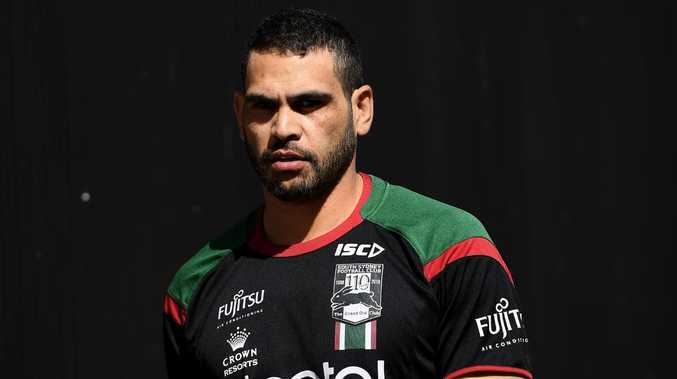 Greg Inglis is ready to go against the Roosters. 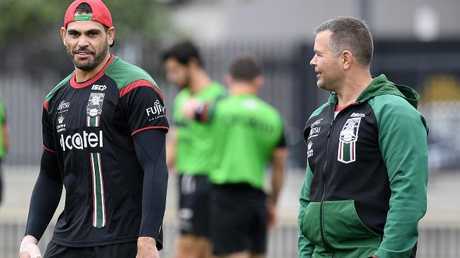 SOUTH Sydney captain Greg Inglis admits being relieved after avoiding suspension for a crusher tackle that could have ruled him out of Saturday's NRL grand final qualifier. Inglis will lead the Rabbitohs against arch rivals the Sydney Roosters after taking the early guilty plea on a grade one dangerous contact charge for a tackle last week. It was the same charge that resulted in a ban for Roosters counterpart Latrell Mitchell, who was brought undone by 75 carry-over points from a previous indiscretion. "It's pretty good to have a clean record. It's quite handy the grading and obviously happy to play," Inglis said on Tuesday. "I didn't lose any sleep over it. I wasn't nervous at all. "I knew whatever the match review committee came up with, there was nothing I could control." Inglis did concede that the crusher tackle - where an attacker's neck gets bent forward by the weight of a defender - is a "disturbing" trend in the game. Greg Inglis pleaed guilty to a crusher tackle for this effort on Dragons rival Tim Lafai. Melbourne star Will Chambers will make his return for the Storm in Friday's preliminary final after missing their past three matches for a similar incident. Inglis insists no player commits the illegal tackle deliberately. "Even though I did get charged for one, I didn't mean anything by it," he said. "There was no menace (sic) behind it or anything like that. It was one of those accidental things that just happen. "I personally don't like the tackle even though I got charged by it. "It's a disturbing feeling to have once you do ever put one on and get done by one. "It's not a great tackle to be charged by." A win for the Rabbitohs would advance the club to a decider for the first time under Inglis' captaincy, against Melbourne or Cronulla. It will be cap off an inspiring turnaround from the Kangaroos and Queensland State of Origin representative, who missed all of last season with an ACL injury and also battled depression. "Having 12 months off last year did hurt. I didn't think I'd be back in this position," Inglis said. "To have the team I play in every week has helped me get me back to where I am now. "Playing in a prelim game against the Roosters, doesn't get much better than that for a spot in the GF."